Today’s reagent is one that most students have experience in making at some point or another. Grignard reagents are formed by the reaction of magnesium metal with alkyl or alkenyl halides. They’re extremely good nucleophiles, reacting with electrophiles such as carbonyl compounds (aldehydes, ketones, esters, carbon dioxide, etc) and epoxides. They’re also very strong bases and will react with acidic hydrogens (such as alcohols, water, and carboxylic acids). Similar to or the same as: very similar to organolithium reagents. Grignard reagents are made through the addition of magnesium metal to alkyl or alkenyl halides. The halide can be Cl, Br, or I (not F). It’s slightly easier to make Grignards from the iodides and bromides, however. Note what’s happening here – the magnesium is “inserting” itself between the carbon and the halide. This halide the “X” referred to when we refer to Grignard reagents as “RMgX”. The reaction behaves similarly with ketones. Again, there’s nothing special about the Cl here – it all depends on how you made the Grignard in the first place. Grignard reagents will also add to esters. What makes these reactions a little more complicated is that they add twice. The net result (after addition of acid) is a tertiary alcohol. This is also the case for acid halides (acyl halides) and anhydrides. One notable exception is carboxylic acids (more on that below). Another important reaction of Grignard reagents is that they will add to epoxides to form carbon-carbon bonds. One thing to keep in mind here is that the tendency is for them to add to the less substituted end of the epoxide – that is, the less sterically hindered end. You can think of this reaction as being essentially similar to an SN2 reaction. After addition of acid, an alcohol is obtained. Grignard reagents also add to carbon dioxide (CO2) to form carboxylates, in a reaction similar to their reactions with ketones and aldehydes. The carboxylates are converted to carboxylic acids after addition of acid (such as our trusty H3O(+) ). Finally, since Grignard reagents are essentially the conjugate bases of alkanes, they’re also extremely strong bases. This means that sometimes acid-base reactions can compete with their nucleophilic addition reactions. One common situation where this crops up is when Grignard reagents are added to carboxylic acids. It’s easy to forget that carboxylic acids… are acids. This means that instead of adding to the carbonyl, they react with the proton instead and form the carboxylate salt. This can also be used to convert alkyl halides to alkanes. First you treat it with magnesium, and then you treat the Grignard with a strong acid. This gives you the alkane. You can also use this to introduce deuterium (D) into molecules! The first step is to make the Grignard reagent. The second is to treat that Grignard with a deuterated acid such as D2O. This gives you the deuterated alkane! So how does it work? The key to the Grignard reagent is actually very simple. When you think about the relative electronegativities of carbon (2.5) and magnesium (1.1), the bond between carbon and magnesium is polarized toward carbon. That means that carbon is more electron rich than magnesium and is actually nucleophilic! Here’s a closer look. In the reaction of Grignards with aldehydes, the carbon attacks the carbonyl carbon and performs a 1,2-addition to give an alkoxide. In the second step, acid is added to give you the alcohol. There are so many other elements to the Grignard but a limited amount of space. So I’ll leave it there. If you want more details you’ll have to check out the Reagent Guide! P.S. You can read about the chemistry of Grignard reagents and more than 80 other reagents in undergraduate organic chemistry in the “Organic Chemistry Reagent Guide”, available here as a downloadable PDF. The Reagents App is also available for iPhone, click on the icon below! I recently came across the interesting set of reactions between Grignard reagents and (terminal) propargylic chlorides. SN2′ substitution gives allenes with a new C-C single bond, along with a mess of other stuff resulting from deprotonation of the terminal alkyne…including the venerable alkylidene carbene, perhaps my favorite obscure intermediate in all of organic chemistry! How can be the reaction between 1,2 unsaturated ketone and grignard reagent ? Discuss the uses of grignard reagent in organic synthesis. Do the carbocations formed during the reaction of aldehydes and ketones with grignard reagent stabalize by 1-2methyl shift or hydride shift??? 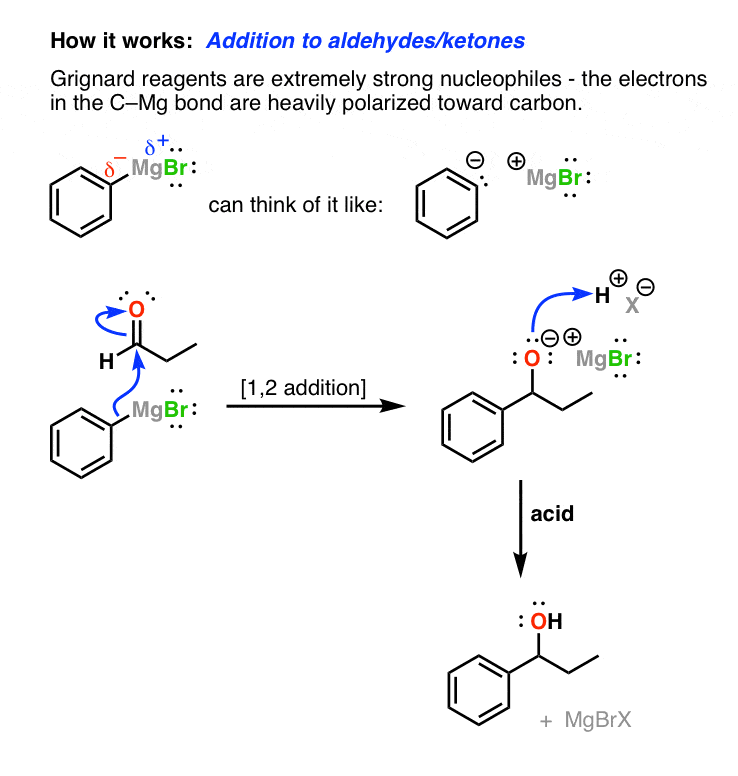 Carbocations are not formed during the reaction of Grignards with aldehydes/ketones. Since grignard reagents deprotonate alcohol. Will it affect the reaction between grignard and aldehyde to produce secondary alcohol? The Grignard addition alone generates the alkoxide. A separate acid workup is necessary to protonate the alkoxide to the secondary alcohol. Why fluorine is not participate in Grignard reagent??? The C-F bond is too strong to be reduced by magnesium. If you were trying to synthesize a product using Grignard chemistry, and the Grignard reactant (R-MgBr) also contained an ester and the other reactant were an aldehyde, would the Grignard reactant possibly react with itself before it reacted with the aldehyde? Yes, it would react with itself. That’s why you need to protect groups that can undergo Grignard addition such as aldehydes, ketones, and esters. Although for esters you can’t protect them so much as just keep them as alcohols and oxidize up after the reaction is complete. Sounds like it just deprotonated the hydroxyl group at the 1 position in the ring, assuming your substrate is 3,4-epoxy-4-methylcyclohexan-1-ol. That alkoxide could probably then go open that epoxide to make a product I can’t name, but should look like a dicyclohexylether with the methyl and erstwhile epoxide OH on one of the rings alpha to the ether linkage. So no diol from having the Grignard open the epoxide because the -OH is too acidic a proton to have in the presence of the CH3MgBr. Ooooh, or you might get a cool intramolecular attack if you throw your substrate in a chair conformation an let the O- attack the epoxide that way. I don’t know. It’s worth building a model or sketching it out. If you were running a very dilute solution of substrate such that two of those molecules finding each other were a very rare prospect, the intramolecular possibility would win. what will be the reaction of grignard reagent with ethanol? It will be protonated by ethanol, destroying the Grignard reagent and forming the alkoxide! We recently did a grignard synthesis in lab using diethyl ether as the solvent and it said that the signs of reaction were cloudiness of the precipitate and bubbles showing up on the magnesium but I can’t figure out what kind of gas these bubbles would be…Would they be the diethyl ether? Probably, yes. Ether has a very low boiling point and the formation of the Grignard generates heat. That would make a boronic ester, precursor for a Suzuki reaction. Hey I understand what happens when you add h30+, but what if you add only h20? Can Grignard attack carbon dioxide twice, since the carbon in the carboxylate after initial Grignard attack would still have a positive delta charge? And subsequent protonation create a geminal? Do grignard reagent reacts with any source of proton to give alcohol? 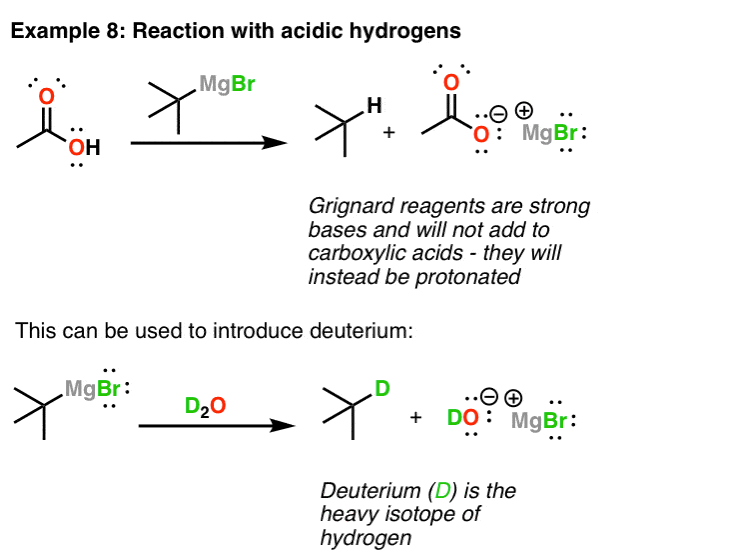 Can just an alkene react with a grigard reagent? Like not the formation of a grignard but after it is formed can it react with an alkene? The short answer is no. The electons in a C-C pi bond in an alkene are shared relatively equally between the carbons, with the result that neither carbon has any significant partial positive charge. Alkenes are unreactive. Contrast that to a C=O bond, where carbon is partially positive and oxygen is partially negative; Grignard reagents are much more reactive in that situation. Why grignard doesnt react with alkene but reaxts with acetylene? Acetylene C-H protons are far more acidic. Is it possible to synthesize Grignard using an organic compound that has nitrogen or oxygen? Oxygen, yes, although it should be protected as an ether and not have O-H. Nitrogen also possible but on complex substrates it’s usually easier to do metal-halogen exchange. Can grignard react with something like dihydropentalene? What would happen if we two moles of grignard (in first attack I believe it will make one side aromatic)? Sounds like you’re asking for the solution to an exam problem. Sure. It’s a strong base. In the case of two equivalents, I think you should check what the resulting structure would be from removing two protons and count the resulting number of pi electrons. What if after the Grignard reaction and the H3O+ are added, there is another H+ added with heat? What would that reaction look like? It doesn’t make sense to add H3O+ and then H+, because H3O+ represents aqueous workup and you’d be heating a biphasic mixture. However I think what you’re getting at is that once you perform the workup, you get an alcohol. If you heat the alcohol with acid, you’ll likely get some kind of elimination reaction. Why would you want to do that? Wouldn’t you want to finish your workup and purify first before adding more acid?